Chester Gillis, Dean of Georgetown College, has an interesting On Faith post on spouses of different religions ahead of Chelsea Clinton’s weekend wedding (she is Methodist and her husband-to-be is Jewish). 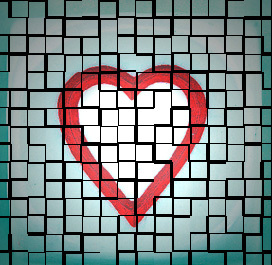 Dean Gillis focuses on some of the issues and challenges interfaith couples often face. Sociologists Jim Davidson and Tracy Widman have shown that there is a method of predicting where interfaith marriage is more and less likely among Catholics (see: The Effect of Group Size on Interfaith Marriage Among Catholics, JSSR, Vol. 41, #3). As shown below, their findings remain consistent in the most recent data available (The Official Catholic Directory 2010). It is almost too simple. 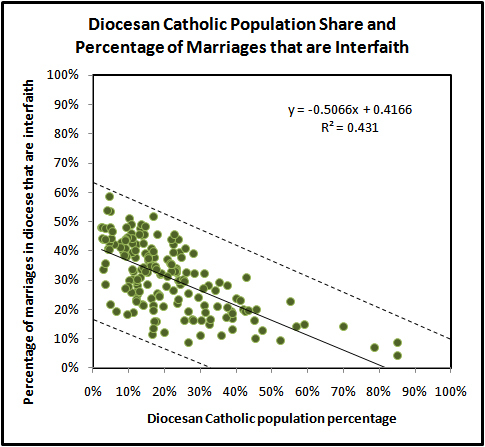 The likelihood that a Catholic will marry a non-Catholic is strongly and directly related to the likelihood that a Catholic will be in close proximity to other Catholics. Social scientists have long understood that proximity is an essential factor in the process of romantic pairing. “A strong determinant of your attraction toward others is simply whether you live near them, work next to them, or have frequent [in-person] contact with them” (Andersen and Taylor, Sociology: understanding a diverse society, 2005, p. 126). The data continue to show this is among the most important factors in the new era of online social networking and dating where it is now easier than ever to meet and socialize with fellow Catholics even when there are none living next door (or nearby). 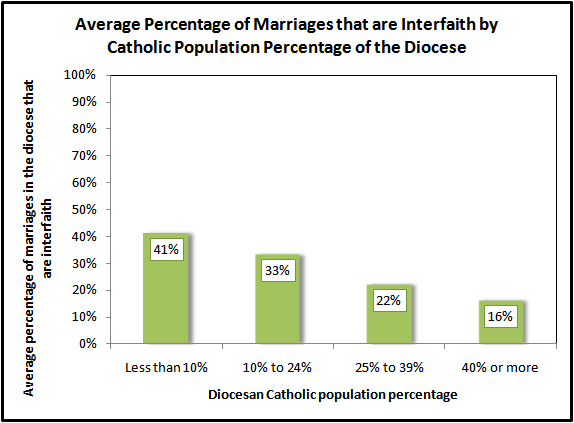 In dioceses where Catholics make up only 10% of the total population, the average percentage of interfaith marriages celebrated in parishes is 41%. By comparison, this average is only 16% where 40% or more of the total population in a diocese is Catholic. Overall, 45,792 of the 174,210 marriages celebrated in U.S. Catholic parishes in 2009 were between a Catholic and non-Catholic (26%). This total of course does not include any other marriages outside of the Church involving Catholics that occur in other places of worship or in secular settings. However, a broader portrait is available in a recent CARA national survey of self-identified adult Catholics, where 28% of married respondents (within the Church or elsewhere) indicated their spouse is non-Catholic. Among never-married Catholics in this survey who said they are at least “a little likely” to be married in the future, only 31% of said it is either “somewhat” or “very” important to them that their future spouse be Catholic. Contrary to popular opinion or anecdote, interfaith marriages are not becoming more common among Catholics in the United States. The rate of interfaith marriage peaked in the 1970s and 1980s during a period where many young Catholics had left urban communities formerly established by immigrant Catholics in the Northeast and Midwest to live in suburbs and areas of the Sunbelt where fewer Catholics resided. In recent years the percentage of interfaith marriages has declined slightly from that peak as new waves of Catholic immigration have recreated majority Catholic communities in the South and Southwest. The regression below (where each marker is a diocese) estimates (by the line through the markers) that a diocese where 5% of the population is Catholic will likely have about 39% of the weddings celebrated in parishes involving a Catholic marrying someone who is not Catholic. By comparison, the model estimates this to be 25 percentage points lower, or 14% interfaith in a diocese where the population is 55% Catholic. The model is not perfect and there are many other potential variables that might improve it but by population alone these are the statistical odds and oddities of love… even in the 21st century. Above photo courtesy of Leo Reynolds at Flickr Creative Commons.